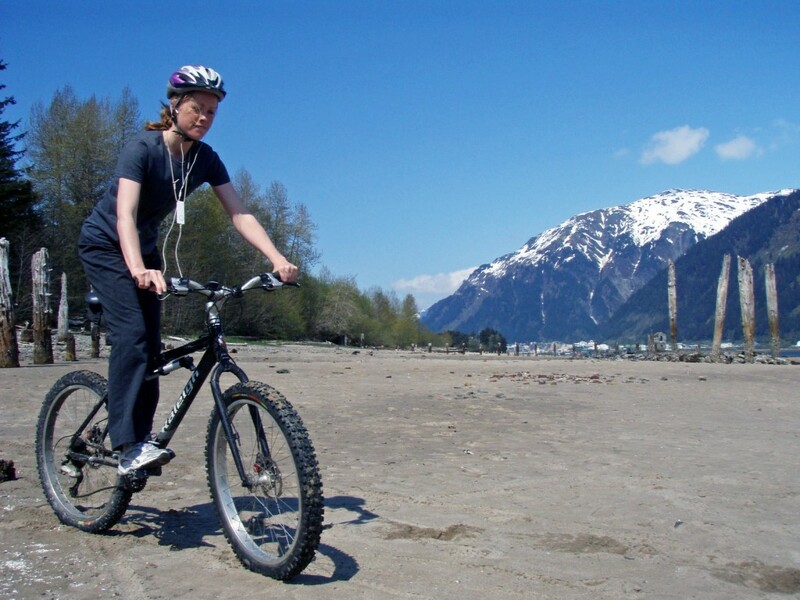 Casually dressed for beach riding on Douglas Island, Alaska, in May 2007. Most pieces of gear — the helmet, the bubblegum-pack iPod, and the Snowcat-equipped faux fat bike that I called “Snaux Bike” — are gone. But others, like the polyester lounge pants, live on. 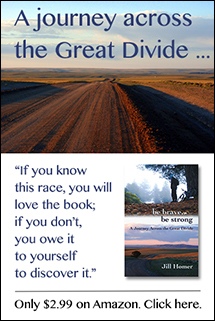 Last week, after wrapping up an eight-mile trail run, I caught up to Beat just as he was pulling off his sweaty shirt to change into a dry one. As he stretched it over his head, the back of the shirt tore from shoulder to shoulder, leaving a basketball-sized hole where there had previously been an accumulating number of micro-tears. The formerly bright blue synthetic fabric had faded several shades, and was scrubbed almost white in the spots where backpacks rubbed against the surface. The Skinfit logo was cracked, the short sleeves were stretched, and the seams were nearing the point of failure. Although I had pulled that shirt out of the laundry many times, wondering about its future, this surely had to be the end. The death of Beat’s favorite shirt. “That’s a bummer,” I said as he examined the tattered strips of fabric. “You should know that this shirt has finished fifteen, no, maybe even twenty hundreds,” he said. “You should give it a proper burial, by fire,” I said. 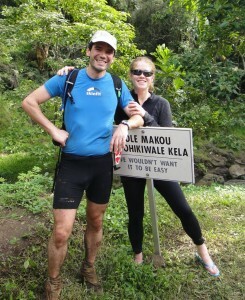 Beat and his favorite shirt at the finish line of the 2011 Hurt 100 in Honolulu, Hawaii. “No, maybe I should hang it on the wall,” he replied, completely serious about the suggestion. Although I’m far from a discerning interior decorator, even I would draw the line at framing a disintegrating old running shirt. Still, the Skinfit shirt had accompanied Beat through countless adventures. It endured hail in the Colorado mountains, drenching sweat and blood in the Hawaiian rainforest, blowing desert sand, coastal fog, mountain rain, high winds, and thousands of miles of hard running. That old shirt had more merit than any of the medals, trophies, or dozens of belt buckles that Beat has collected over years of racing long distances on trails. Maybe it did belong on the wall. That is, after several good hot-water washings. But the clear end of usefulness in Beat’s favorite shirt had me considering whether I own any similar clothing, gear that had endured the elements with me over thousands of miles. I don’t necessarily have a favorite shirt; I like to cycle through my workout clothing on a fairly equal basis. I also enjoy getting rid of stuff even more than I enjoy accumulating it, so older or less-used gear never stays around for long. But I do have one garment — a pair of pants — that have endured dozens, maybe hundreds, of variable adventures. They still sit folded in my gear drawer, or maybe tossed in the laundry basket after a cold evening run, faded and torn. I hadn’t thought about it before, but in a way, these pants are my favorite piece of outdoor gear. They’re not ordinary outdoor gear. The pants came into my possession in the summer of 2005, shortly after my youngest sister graduated from high school. I was the outdoorsy sister in the family, and Sara was the fashionable one, buying closets full of garments in the way I liked to log cycling miles. After her graduation, Sara gathered up a large moving box full of clothes that no longer made the grade for a college-age fashionista. At the time, I was a newspaper journalist who spent most of my disposable income on bikes, travel, and camping gear, so I welcomed the opportunity to grab some free “regular” clothing. I dug through the box and fished out any classic-looking clothing I thought I could get away with. Near the bottom, I came across a pair of stretch pants, size medium. They were dark gray, or light black, one hundred percent polyester, fitted near the hips and thighs, flared at the legs, with a tag that identified them as “Vanity Girl Gear.” “These will be useful for something,” I thought. In the fall, I moved to Homer, Alaska. It was a last-minute kind of life decision, and I arrived in the northern latitudes without much in the way of cool-weather clothing. The Vanity Girl pants became my go-to layer for riding bikes in the crisp and humid air of autumn, because the thick polyester wicked sweat and held in heat, and also seemed to work better than my bike tights at blocking wind and keeping my tush warm. 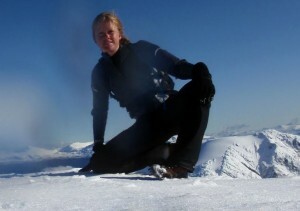 On top of Mount Roberts in Juneau, Alaska, in October 2009. The pants were also versatile as an under-layer. As winter deepened, I discovered they worked better than my snow pants for hiking and cross-country skiing, because they prevented the accumulation of moisture on my skin, but didn’t feel hot when I was going hard. The flared legs offered plenty of room for the knee-high wool socks I liked to wear, and the thighs were roomy enough to allow for a thermal layer underneath. They also worked well for outings in the cold rain, holding in heat even when they were soaked. It wasn’t long before I was wearing the Vanity Girl pants everywhere — warm in winter, cool in summer, and decently flattering, they were my favorite piece of gear. As the years passed, the pants accumulated their own battle scars. The right cuff is absolutely shredded from numerous catches on bicycle chainrings. The shin areas sport tiny tears from occasional mishaps with platform pedals. The back of lower right leg is torn where I caught the fabric on a branch while climbing over a fallen Sitka Spruce tree in Juneau. The seat of the pants are faded, but still surprisingly resilient for what must be thousands of miles of saddle wear. There’s a hole in the left knee from the time I rear-ended my friend while we were road biking on the Homer Spit, and subsequently hit the pavement at eighteen miles an hour. But the hole in the pants perfectly matches the pink scar on my kneecap, and all of the little rips and tears carry their own happy memories of past adventures. 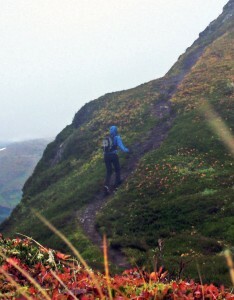 Hiking the Juneau Ridge in an autumn rainstorm, September 2008. I’ve moved a half dozen times since 2005, and each time I go through a satisfying purge of no-longer-useful items, the Vanity Girl pants still make it into the keeper pile. Even now, more than seven years later, with countless more appropriate layers for winter cycling, rain running, and mountain climbing, I still find myself pulling them out of the drawer and taking them out for an afternoon spin or winter trail run. Maybe it’s the nostalgia I hold onto, or maybe it’s the truth that, to be a great piece of outdoor clothing, a garment doesn’t necessarily have to be a great piece of outdoor clothing. What is your most enduring piece of outdoor gear? I have aCannondale cycling jacket that has zip off sleeves. I have reached for that more times than I can count for everything from a short commute to work on the bike to a 4 hour trail run. The fabric is getting thin, the water resistance is basically gone, and the reflective accents are basically not there anymore. I would like to get a new jacket, but its hard to part with this one. I guess I need to let it die a peaceful, glorious death like Beat’s shirt. One day it’ll just rip in half and I’ll have a ceremony. It won’t be going on any walls though. Excited to follow your new site, Jill. I love this post especially! I have thought this same thing a lot, actually. I have a baselayer shirt that has been on every hike, every 14er, CTR, AZT and every road or mtb ride when the temp is under 50F. It, and of course, my Oregon beanie could tell some stories. I have a baselayer top from REI that I’ve used on or after every single hike I’ve done the last four years (except the really sweltering days, but we don’t get many of those here). I also use it for cold-weather running…and cold-weather-don’t-want-to-turn-on-the-heater days. I’m dreading the day it disintegrates (which will surely happen soon) since REI totally changed their baselayers and the new ones are nowhere near as comfortable. Mine is soo nice and soft after being washed so many times. Yikes, I really do have an emotional attachment to it! Running shirts ought to be located well appropriate for the reason that if they are too billowy,they can reduce your aerodynamics and enlarge drag. This is all as it should be if you are just running recreation-ally, but if you are irritating instead of a individual preeminent or else running a line,it may well add seconds or else minutes to your phase.